Beer in Berlin: the consensus in the (English speaking) beer-o-sphere is that it’s a bit of a limbo; there’s nothing much going on. I arrived armed with Ron Pattinson’s pub guide and an open mind. In many bars I went to they just ask you if you want a light or dark beer, and that’s it. Dunkel or pils, basically. Maybe they were just simplifying things for the tourist, but I doubt it. 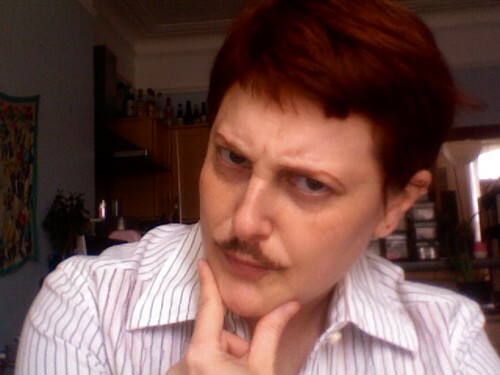 Much of my visit to Berlin, a very white town, could be shook down to that question. The troubled notion of race here coupled with the amazing history of survival, heroic struggle and attrocity makes that simple question poignant. 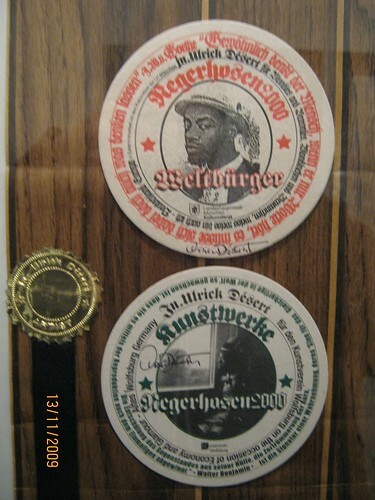 At the Schwules or Gay Museum, I spied Artist Jean-Ulrick Desert’s commemorative beer mats from Negerhosen 2000, a performance piece where he traveled around Bavaria in traditional costume, having his picture taken with Bavarians. The project was essentially a playful take on Bavarian conservatism, and the artist is very much a Berliner, and the piece is very Berlin– ironic, sly, complex. I wondered what would be the beer that would go with the mats? Something trad but playful, throwing something new into the mix. I looked, but have yet to find that beer. My go-to beer for the trip was a beer not brewed in Berlin, and yet it was everywhere: Warsteiner, which I first had with amazing vegan pho at a little nameless place in Danziger Strasse– the white grape note of the beer stood out brilliantly against the fresh basil and chili. BarMas at the BittenBullet has a recent take on conservative German attitudes to brewing, and it’s true that the Reinheitsgebot, or the 16th brewing purity laws which most brewers still follow, would limit the chances brewers could take, and in turn the styles that are brewed. Most German beer I’ve had is perfectly pleasant, consistent– it asks little of the drinker. Various smoky rauch beers aside, it is rarely extreme. Except when you consider Berliner Weisse, a young beer which, without the compulsory syrup, tastes very much like a Belgian lambic. Sour in the extreme, what I consider refreshing others might see as undrinkable. The mouthfeel is less of the lambic’s barley wine and more of a lively ale. The most popular beer in Berlin in the 19th century, it’s now only brewed by Berliner Kindl. 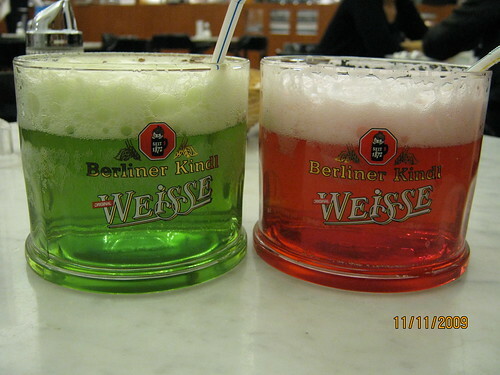 I drank it both with and without syrup, and confess to really loving the grün, or woodruff syrup, called waldmeister or forest master– a candy cocktail suitable for the great god Pan. It’s normally drunk in the spring but if it was on the menu, that’s what I ordered. I was pretty smitten with the unusual sourness and the lively mouthfeel. Drinking it mit schuss made me feel like I was celebrating something. Others have compared drinking the cocktail to an alcopop, but I don’t see it– at 3% it’s not exactly a “get hammered fast and sweet” sort of drink. It didn’t taste like a softdrink. Even with the syrup you could taste the earthy wheat of the beer and a chamomile-like fruitiness, but of course these were more pronounced without the sweet additive. Why it is served with a straw I’ve no idea! Berlin is a cocktail-crazy town, full of fun little bars offering swanky, original takes on trad cocktails and it’s in this spirit the Weisse should be had. In one particularly inspired version I had it with passion fruit liquor. Still, no matter what local tradition dictates, I’m not drinking beer through a straw. 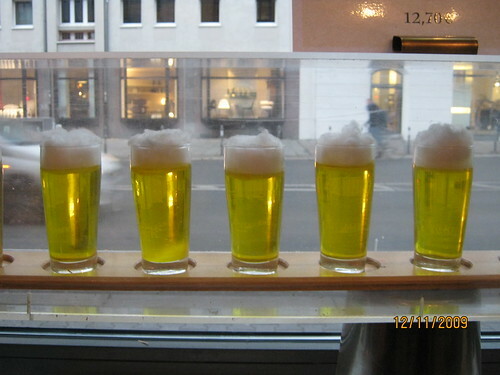 I went to two microbreweries in Berlin– there might be more but I couldn’t find them. The first was Marcus Brau, a microbrewery housed in a side street of tacky shops in the rather grim shadow of the Fernsehturm, on the outskirts of Alexanderplatz. Like many other bars, the choice here is simple: light or dark? Young Marcus himself, rather bored and annoyed to be interrupted from his web surfing, served us. Mr. Malting had the pils and I the dunkel. we sat in a wooden booth, surrounded by blinking fruit machines and homey decorations from the 1970’s, possibly older than the brewer himself! A table of three regulars consumed what little service there was to be had. Mr. Malting wanted another pils and the guy couldn’t seem to be bothered. 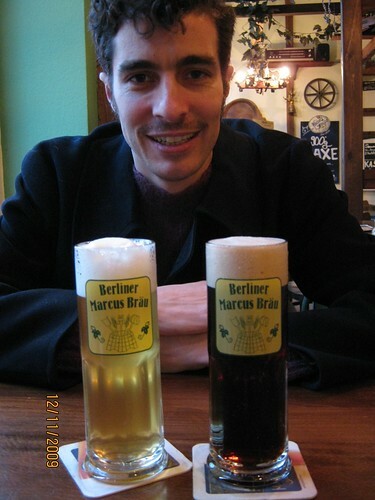 When he finally ordered, Marcus forgot to bring the beer. I couldn’t finish the dunkel. I know Boak and Bailey have often used homebrew-like as a pejorative and I didn’t quite get it until now. The dark beer tasted like something had gone wrong, there was a iodine-aniseed note that was really hard to get past and I just kept thinking, homebrew. The pils was free from this aftertaste. 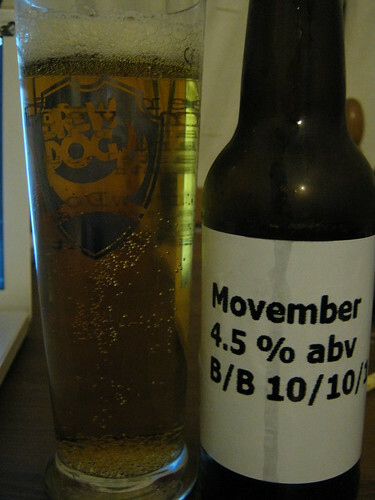 It was drinkable, but pils is not my favourite style. It had a very subtle cilantro note, and was a bit grassy in a pleasant way. Still, nothing special and certainly not worth waiting 20 minutes for the brewer to quit talking to the regulars and bring it to you. The other microbrewery we tried was far better. Hops and Barley brewpub in the happening neighborhood of Friedrichshain is an elegantly tiled bar with a smoking and non-smoking room (a big deal in Berlin if you are a non-smoker!). This place has a real welcoming, community feel and is run by two friendly guys, one of which is Philipp Bokamp the brewer. They let me taste everything, and even asked me if I was a homebrewer, and what styles I liked to make. It’s clear they are passionate about beer here! The one guy kept chiding me about my “little black book of beer”– the Moleskine notebook where I was taking notes. They wanted to know what else we’d had in town and what we thought of it. I loved the beer I had there– everything tasted very clean and fresh. The Friedrichshainer Amber was my favourite– with a kumquat nose and strong presence of Brewer’s Gold hops. Philipp said there was another kind of hop in here as well, something that grew near a large lake in Southern Germany, but I didn’t write it down because I confess I was rather tipsy. The dunkels had a big chocolate front with a very light mouthfeel, making it easy to drink more of it despite the richness. My second favourite though was the delightful cider: cloudy, tart and just sweet enough to round out the yeasty, grassy middle. Beautiful stuff! At one point I asked Philipp if he would ever consider brewing his own version of the Berliner weisse (the name is proprietary– technically only breweries in Berlin can make it.) He explained, politely, no way. It would be too much of a risk for a small scale brewery to willfully use lactobacillus, something that is considered an infection in a normal beer. He felt that weisse is basically a brewing error now marketed to people who don’t know any better, and if he were to make it no one would drink it, and if no one drinks his beer he would have to close up shop. That would be a very bad thing, indeed.